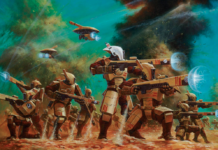 A long time ago in a galaxy far away I wrote an article about how to trapping units in combat, but I didn’t dive into detail about what to do when you’re in that situation. Well, today I have quite the treat for you. A tactic that many top players frequently employ, yet one I rarely see utilized by the more average players. We have a classic Eldar gunline with some dark Reapers, cat lady, Eldrad, a Farseer, an Autarch, and a Serpent. Screening them is two units of rangers up front, who are pushing back some Stygies Electropriests. The Electropriests have first turn and are ready to move up and launch a potentially game winning turn 1 charge. The priests moved up and charged, only declaring a charge against 1 of the 5 man ranger units. They are >1″ away from the ranger squad on the left and engaged with the ranger squad on the right. So, you’ve kept with your Brown Nights at the Game Table articles and you know how to surround stuff in combat now. In fact it’s your go-to move, and at this point it’s second nature. And that’s exactly what happened here. Poor Billy, didn’t know what he signed up for when he decided to join Ranger duty. Well, now you’re the Eldar player. 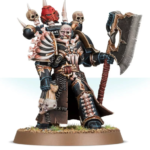 You’re starring at 20 Electropriests with a 2++ invulnerable, FNP, who are surrounding Billy the ranger, and are salivating at the thought of charging your dark reapers and characters next turn. Well, what do you do? You take your time and make a plan. A unit’s shape has a subtle, yet very powerful impact on how it can move. The Electropriests are spread out in a long line to maximize their frontage in order to engage the rangers effectively and try to pin the sneaky, little Eldar in the corner. However, while the Ad Mech player thought he was being clever with his positioning, a great player will be able to capitalize on his critical positioning error. The Serpent on the bottom left of the hill moves 16″ over to the side, while the autarch on the top right of the hill moves 16″ straight up. You also built your gunline well, and put in some smite-esque mortal wound mechanics. Getting trapped in combat is pretty much a gunline’s worst nightmare, and it’s a very, very real threat. Introducing smite or other mortal wound mechanics to your list can do wonders to mitigate some of the impunity your opponent gets when he locks himself in combat with you. Here the Eldar player pumped 3 smites from his psychers and popped his serpent shield for a total of 4d3 mortals. I conservatively pulled 5 Electropriests from the unit, because they have feel no pain to stop some of the smite damage. 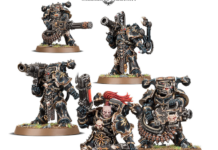 With that in mind you charged the Serpent and Autarch into the sides of the unit where they hopefully won’t take too much damage from the return attacks. Let’s just assume the Serpent and Autarch accomplish exactly 0 wounds in combat because 2++ invuls and fnp are quite annoying to chew through the hard way. This is a picture of what the situation looks like after the Electropriests pile in the first time, and punch the rangers in the face. Poor Billy. Note, they still get a 3″ pile in, which they’re about to make. Remember, a model must must move closer to the closest model, even for the consolidation. The pen in the middle of the unit of electropriests represents the dividing line between which models are closer to the Serpent, and which are closer to the Autarch. 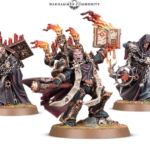 That means the models on the left have to consolidate closer to the serpent and the models on the right have to consolidate closer to the Autarch on the right. There is another stipulation here though. Models must also remain in coherency when they pile in/consolidate. As you can see, the two models nearest the pen are pretty much at maximum coherency. That means neither model can move toward the enemy units they need to move towards without breaking coherency, and thus they can’t move. Consequently, the next few models are tethered to them as well by their 2″ coherency. 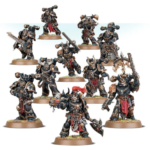 Over the course of the whole unit, this effectively means that 5-6 models won’t be able to move at all, and nearly 1/3 of the Priest unit will be spent immobilly bridging coherency, and not fighting. 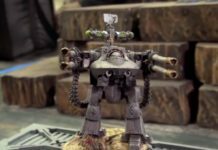 This excellent implementation bought you all the time you needed to deal with the incoming Electropriest threat, and engage whatever other portions of the Ad Mech army you needed to with your long range reapers. When executed properly, little tricks like this can totally stop an assault army in its tracks. 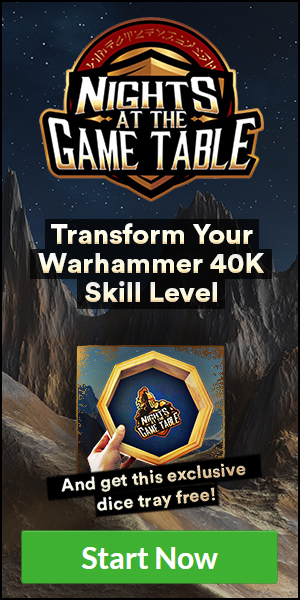 40k is a game where nearly every situation has an infinite amount of breakdowns on how it can be handled. Building a list with all the tools is half the battle, but the other half is knowing how to use your toolbox. To learn more tricks, tactics and strategies from me personally and directly just follow the link to become a pro! Next articleCould this image be teasing a new unit? !